Local Caterpillar Host Plants: Dendropthoe pentandra (Loranthaceae, common name: Malayan Mistletoe), Macrosolen cochinchinensis (Loranthaceae, common name: Chinese Mistletoe). Another male Green Baron in the company of a smalll ant. On the upperside, the male is dark green with a lighter green tornal area in the hindwing. 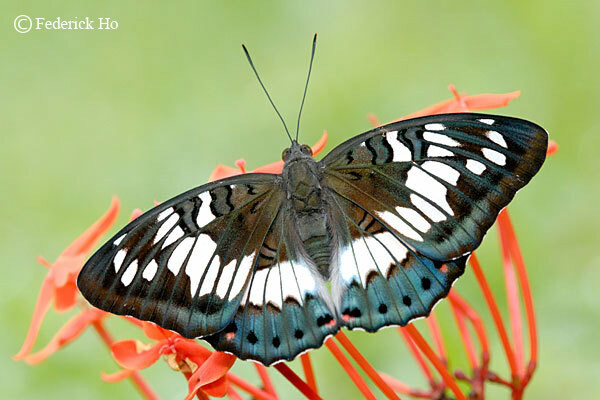 The forewings have white sub-apical and post-discal spots. 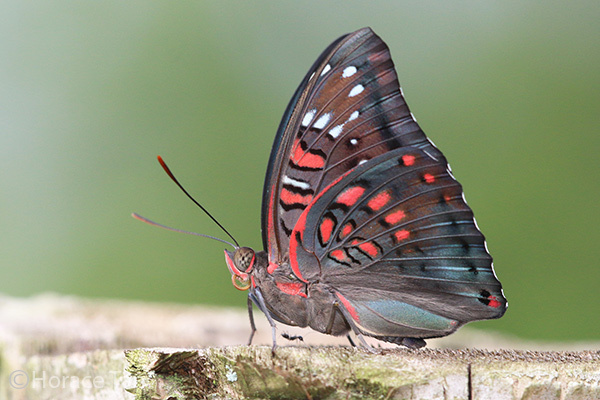 Distinct red spots can be found in the apical area in the hindwing. 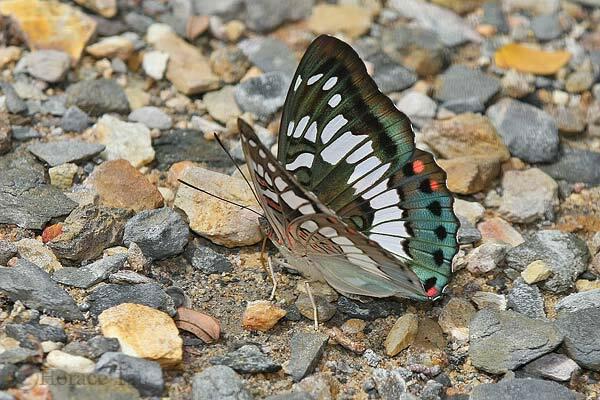 The female has a broad white band, with blackened veins, across both wings. The marginal area of its hindwing is prominently marked in green. 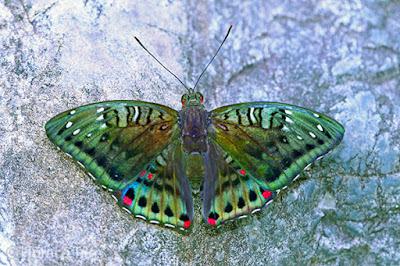 A female Green Baron, showing its underside. A female Green Baron, showing its upperside.. 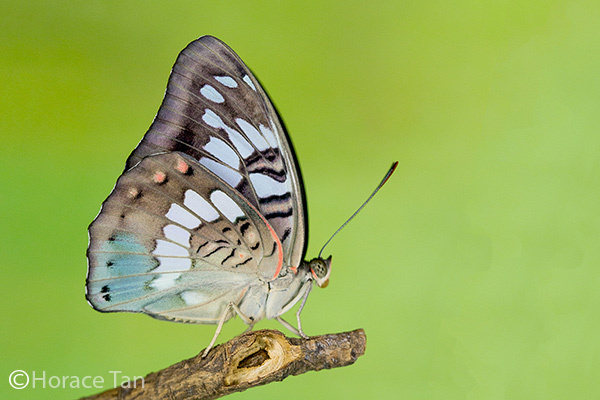 The Green Baron is moderately common in Singapore. 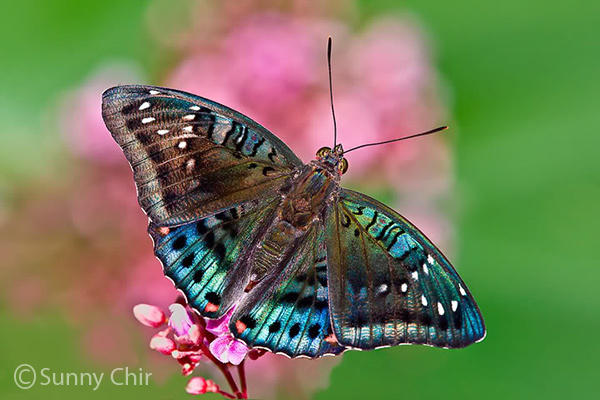 They can be found in urban parks and gardens as well as in the nature reserves. The adults are strong and fast flyers and react readily to any intrusion into their territory. Both sexes have the habit of visiting flowers and ripened fruits. A female Green Baron pudding on wet ground. 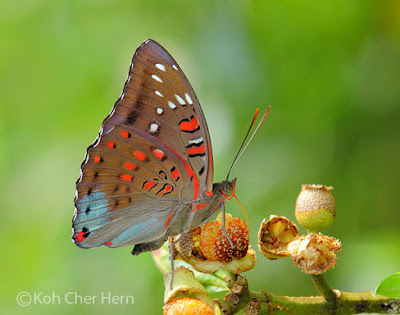 A male Green Baron visiting ripened fruits of the Singapore Rhododendron. A common parasitic plant, Dendropthoe pentandra, has previously been recorded as Green Baron's host plant. 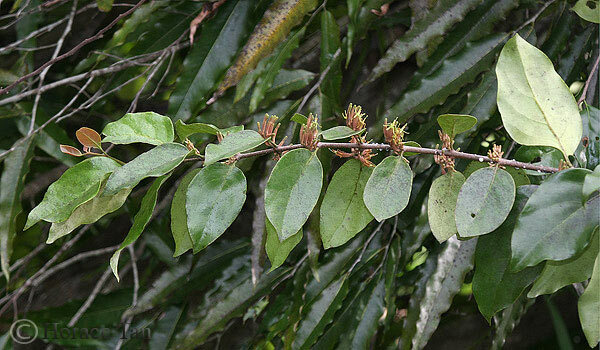 Recently, another parasite plant, Macrosolen cochinchinensis, was found to play the same role. 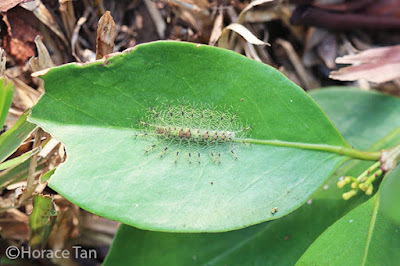 Caterpillars of the Green Baron feed on mature leaves of the host plants, and rest on the leaf upperside between feeds. 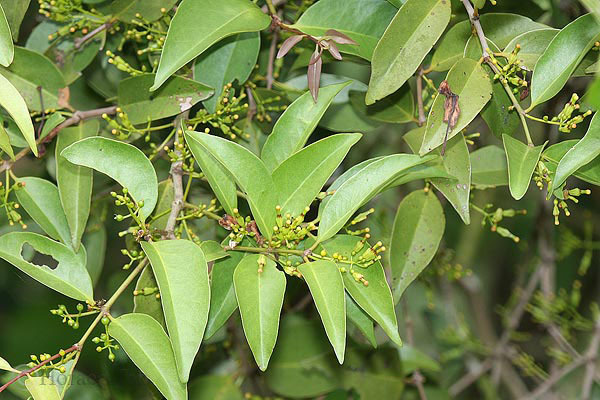 Local host plant #1: Dendropthoe pentandra (common name: Malayan Mistletoe). Local host plant #2: Macrosolen cochinchinensis (common name: Chinese Mistletoe). The eggs are laid singly on a mature leaf (typically on the upperside) of the host plant. 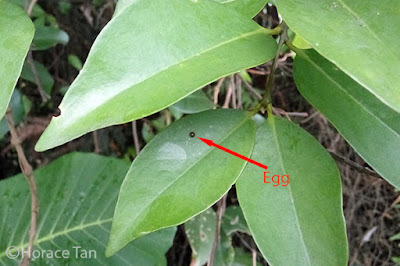 Each pale-brown egg has a low dome-shape with a base diameter of about 1.8-1.9mm. The surface is covered with large hexagonal depressions with yellowish hair-like protuberances emerging from adjoining corners. Each protuberance has a droplet-like terminal end. 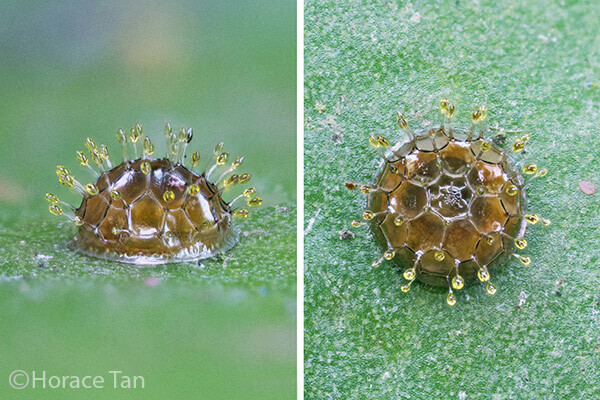 An egg of the Green Baron laid on a leaf of the Chinese Mistletoe. Two views of a mature egg of the Green Baron. After about 4-5 days, the 1st instar caterpillar emerges and proceeds to eat the eggshell as its first meal. The caterpillar is yellowish in body colour and has a black head capsule. Its body sports ten pairs of long, yellowish and "fleshy" dorso-lateral protuberances. Black setae emanate from the body below these long protuberances and from a series of short dorsal protuberances. 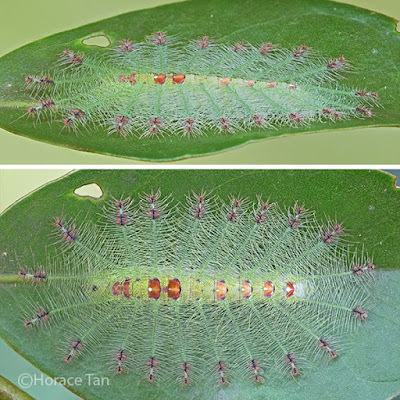 The caterpillar grows from an initial length of about 3.4mm to 6mm in about 2-2.5 days. 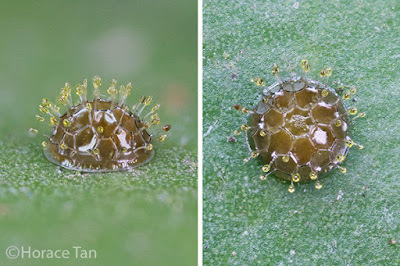 A newly hatched caterpillar, resting after devouring part of its egg shell, length: 3.4mm. 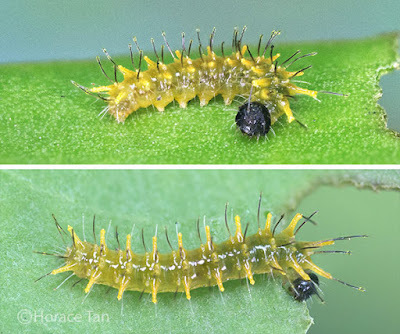 Two views of a early 1st instar caterpillar. Two views of a late 1st instar caterpillar, length: 5.9mm. 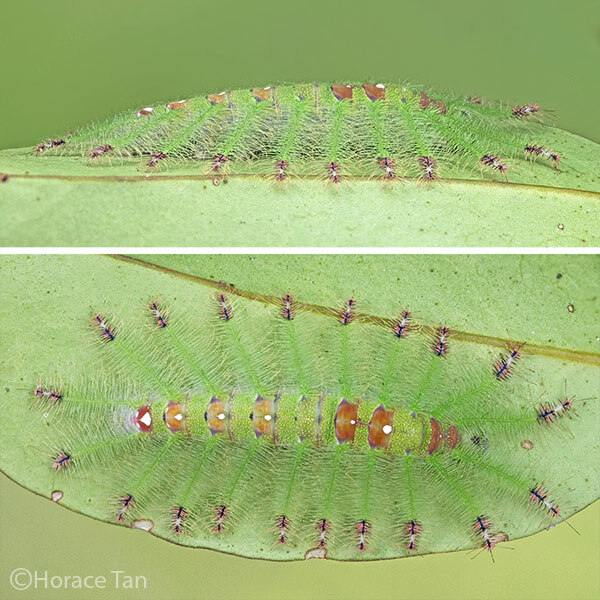 The body of the 2nd instar caterpillar is predominantly yellowish green. All ten pairs of short protuberances seen in the 1st instar have lengthened considerably. Each is projected horizontally with numerous branched spines and is almost always pressed to the leaf surface. The protuberance is mainly pale yellowish in color. Some branched spines are black in colour. On the dorsum, pale brown patches appear between all ten pairs of protuberances. As growth progresses in this instar, these patches become darker brown, most prominently in the two patches between the 4th and 5th pairs. 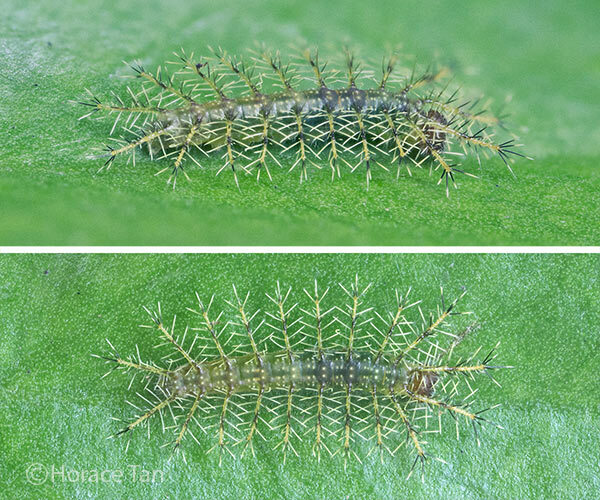 The 2nd instar lasts for 2.5-3 days with the body length reaching about 10-11mm before the moult to the 3rd instar. 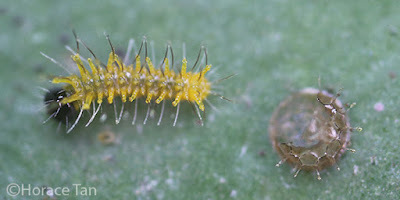 A 2nd instar caterpillar, newly moulted, length: 6.5mm. 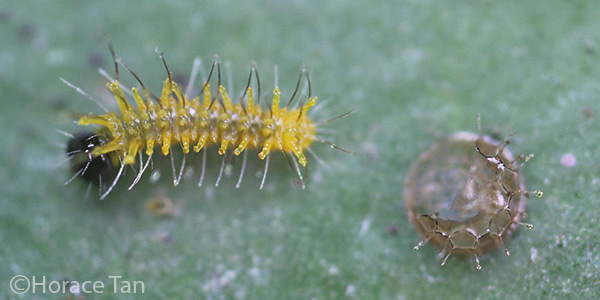 Two views of a 2nd instar caterpillar, length: 8.8mm. 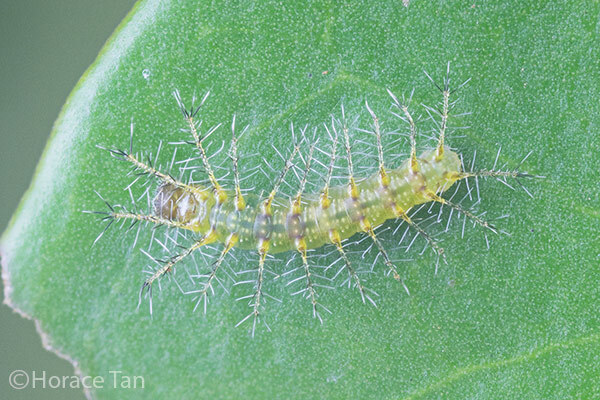 A late 2nd instar caterpillar, dormant prior to its moult, length: 10.2mm. 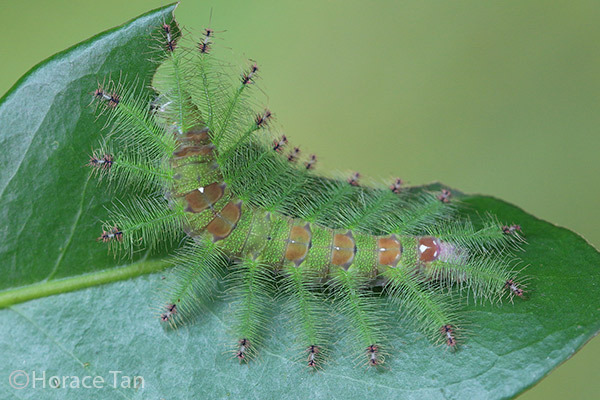 The 3rd instar caterpillar is yellowish green in body color. The protuberances have all become much longer in proportion. The branched spines appear almost like a bird's feather, with the secondary spines arranged neatly around the main spine. The branched spines are black at the terminal end as well as at the one-third length from the end. Brownish dorsal spots appear on the dorsum, one between each pair of protuberances (except for the 3rd and 6th pairs). The 3rd instar lasts for about 3 days and reaches a length of about 16-18mm before the next moult. 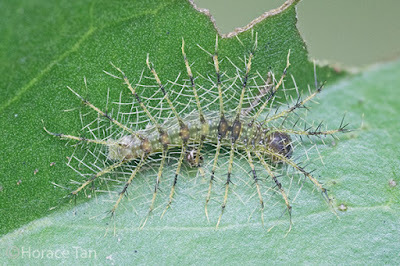 A newly moulted 3rd instar caterpillar, length: 10mm. 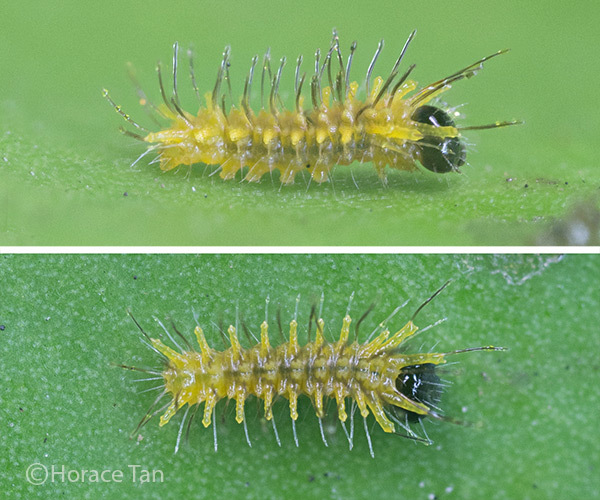 Two views of a 3rd instar caterpillar, length: 16mm. 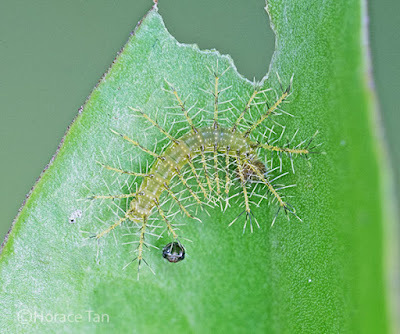 A late 3rd instar caterpillar, dormant prior to its moult, length: 17.5mm. A 3rd instar caterpillar found in the field on a leaf of the Chinese Mistletoe. 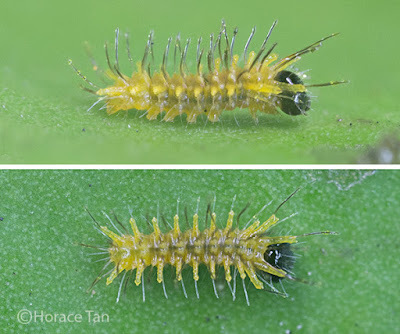 The 4th instar caterpillar has similar appearance as in the 3rd instar. Spines on each long greenish protuberance are now mostly green and the two black portions near the terminal end of each portuberance more extensive. Each brown dorsal spot, except for the spots between the first two pairs of protuberances, now features a small white spot along the leading edge. 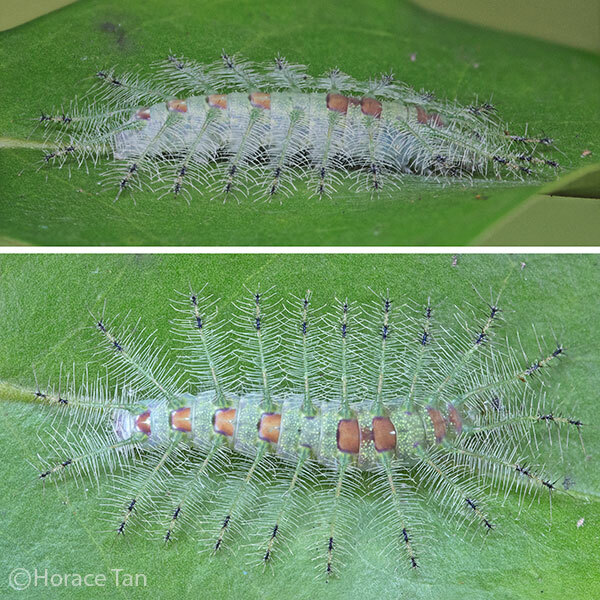 After about 5-6 days in this instar, and its body length reaching 27-28mm, the caterpillar moults to the 5th instar. 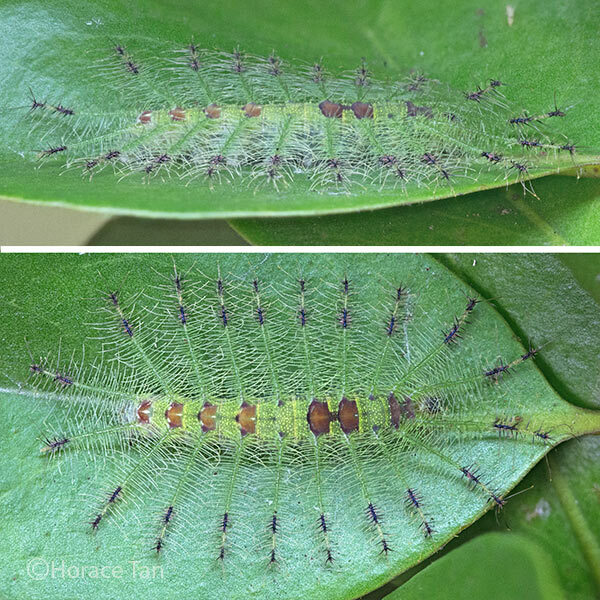 A newly moulted 4th instar caterpillar, length: 16mm. 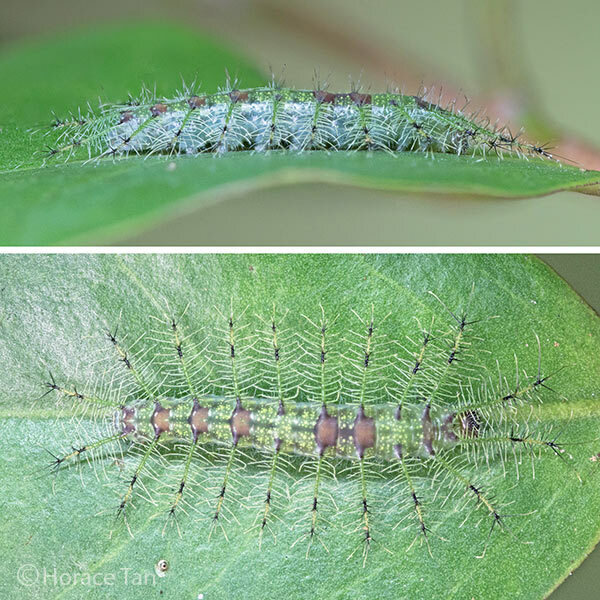 Two views of a 4th instar caterpillar, length: 22.5mm. 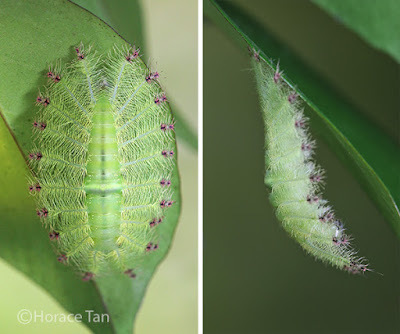 Two views of a late 4th instar caterpillar, dormant prior to its moult, length: 27mm. 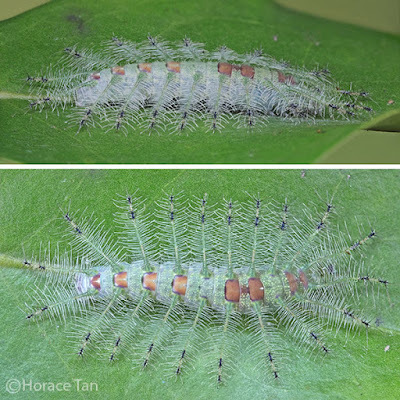 The 5th instar caterpillar adopt a few changes in its appearance. Lateral spines in the previously black portions and terminal end of each portuberance have changed colour to pink, and the part between these two are now whitish in colour. Another observable change is in the brown dorsal spots which are now broader and more prominent in this final instar. 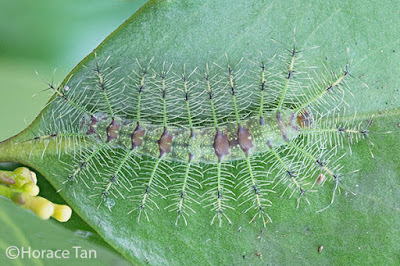 A newly moulted 5th instar caterpillar, length: 29mmmm. Two views of a 5th instar caterpillar, length: 36mm. A 5th instar caterpillar feeding on a leaf of the Chinese Mistletoe, length: 39mm. This final instar lasts about 6-7 days with the caterpillar reaching a length of about 41-43mm. 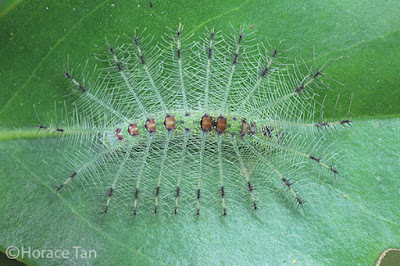 On the last day, the caterpillar ceases its feeding activity and its body shrinks in length. It then seeks out a spot on the underside of a leaf and stays put. There it spins large quantity of silk threads to make a silk mound, to which its posterior claspers are then attached to. Now the pre-pupa hangs from this anchor point in a head-down posture. A short transverse pale yellowish band appears on the dorsum about mid-body. Two views of a pre-pupa of the Green Baron, early in this stage. After about 1 day of the pre-pupal stage, pupation takes place. 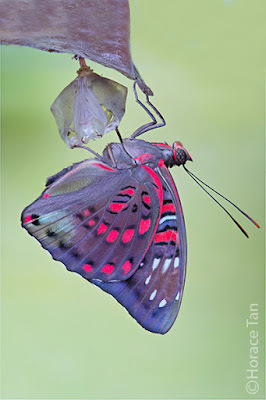 The yellowish green pupa is suspended with its cremaster firmly attached to the silk mound. It has a smooth body which tapers steeply towards each end from a yellowish transverse dorsal ridge (which ends at the wing case with a brown spot). A short series of brown spots appear along the edge of wing case, with the middle one the largest one and featuring an embedded beige spot. Length of pupae: 19-21mm. The pupation event of a Green Baron butterfly. Two views of a pupa of the Green Baron. Ten days later, the pupa becomes considerably darkened, especially in the wing case area, signaling the end of the development of the adult still encased within. The next day, the adult butterfly emerges. 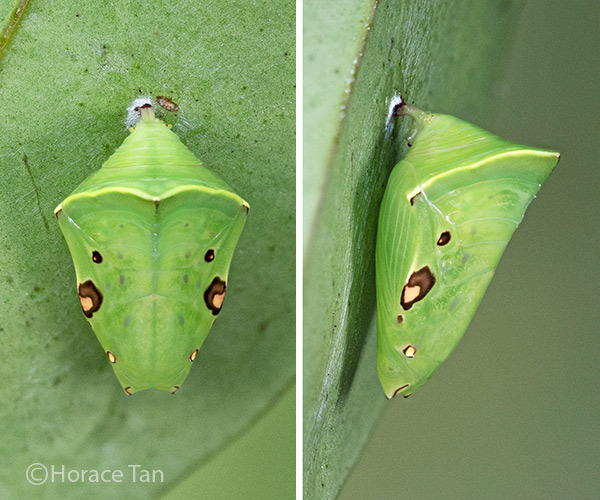 Three views of a mature male pupa of the Green Baron. A newly eclosed male Green Baron clinging on its empty pupal case. 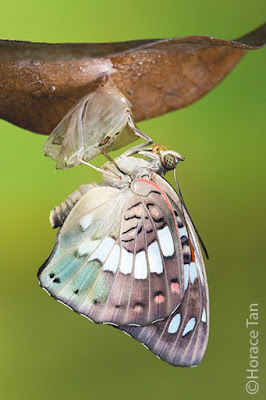 A newly eclosed female Green Baron clinging on its empty pupal case.